Universal cleaning paste effectively cleans the bonding surface of prosthetic restorations after intraoral try-in. Creates an optimum prerequisite for the adhesive luting of all indirect restorations. Ivoclean was used by 24 consultants in 484 uses. It received a 91% clinical rating. Ivoclean is a universal cleaning paste indicated for cleaning of prosthetic restoration surfaces that have been contaminated during intraoral try-in. Ivoclean contains sodium hydroxide and is for extraoral use only. It is compatible with all dental restorative materials including glass-ceramics, zirconium oxide ceramics, aluminum oxide ceramics, precious metal alloys, base metal alloys and lab-fabricated composite restorations. 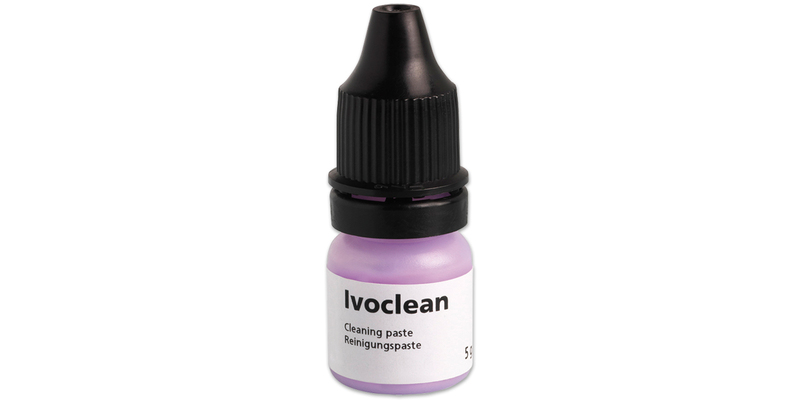 Ivoclean is designed to enhance adhesion between indirect restorative materials and adhesive cements by effectively cleaning contaminated bonding surfaces. The lavender-colored solution is supplied in a 5g dropper bottle. The solution must be shaken before use, applied to the restoration and then thoroughly rinsed. Contamination of indirect restorations with saliva or blood during try-in is a common occurrence. Ivoclean was developed specifically to clean restorations before cementation. The solution must be shaken vigorously, and the clear bottle allows the user to visually confirm that homogeneity has been achieved. Ivoclean is easy to spread with a brush and rinses away easily. Contaminants such as blood and saliva can be completely removed. Colored indicator pastes or sprays, which tend to stain etched ceramic surfaces, also come off cleanly. Testing at THE DENTAL ADVISOR Biomaterials Research Center confirmed that the use of Ivoclean was effective in maintaining or improving the bond strength of resin cement to zirconia and lithium disilicate after contamination of these surfaces with saliva. 74% of consultants found Ivoclean to be better than other methods of cleaning restorations after try-in, while 22% found it to be equivalent. 82% would switch to Ivoclean and 89% would recommend it to a colleague.